A new book has given an insight into how money was raised for the spirited campaign to keep former President Olusegun Obasanjo in office beyond his second term in 2007. It also reveals how the campaign began and the individuals who conducted it. The so-called Third Term Agenda collapsed May 16, 2016 when the Nigerian Senate threw out the Constitutional Amendment Bill. Mr Obasanjo left office a year later on May 29, 2007 and has since stridently denied being interested in staying longer or playing any part in the agenda, despite admissions to the contrary by some of the principal actors. The new book, however, a close scrutiny of the Third Term Agenda, names some of the aides and associates who pushed the agenda, states how a massive war chest was built for it and reveals some of the sources and individuals who provided the money. The book, "Too Good To Die: Third Term And The Myth Of The In Dispensable Man In Africa", was written by Chidi Odinkalu and Ayisha Osori. Mr Odinkalu, a lawyer and civil rights advocate, is senior team manager for the Africa Program of the Open Society Justice Initiative and former Chairman of the Governing Council of the National Human Rights Commission. Mrs Osori, also a lawyer, writer and management consultant, is the executive director of the Open Society Initiative for West Africa (OSIWA). According to the authors, although Nuhu Ribadu, who at the time was Chairman of the Economic and Financial Crimes Commission (EFCC), estimated the campaign gulped $300 million, evidence suggested the cost was much higher. "When all the cost elements, including the public relations campaigns, additional incentives, the work of the JCCR (Joint Committee on Constitutional Review of the National Assembly) and constitutional conference, as well as inevitable incentives to the security services, are added to the inducements proposed for legislators, it seems almost certain that the budget for the third term was in excess of $500 million or half a billion dollars," the authors state. The book provides an insight into how the money was raised. "None of this money was lawfully appropriated. They could only have been generated by theft, diversion or misappropriation of public resources. "Among many sources that were raided, the Obasanjo administration patented and pioneered a habit of unusual withdrawals from Nigeria's Excess Crude Account, a rainy day, sovereign savings scheme funded by the extra earnings from Nigeria's petroleum exports. "2006, the year in which President Obasanjo hoped to achieve an elongation of his tenure by constitutional amendments, was by some unusual coincidence also the year in which Nigeria achieved the highest inflow into the ECA. In that year, the fund had an inflow of $29.614 billion from oil export earnings. "In the same year, however, the administration also inexplicably authorized withdrawals from the ECA totaling the sum of $29.799 billion, resulting in a net negative balance of $184.404 million. In one year from 2005 to 2006, coinciding with precisely the most active period of the third Third Term Agenda, President Obasanjo authorised unusual payments totalling12.176 billion Naira, reportedly to fund the Niger Delta Power Plants and the National Independent Power Project (NIPP). "Until then, this volume of payments out of the ECA was unprecedented. There is scant evidence that these sums were in fact administered for the declared purpose. "Some of the disbursements from the ECA may plausibly have gone towards public purposes like the management of Nigeria's debt settlements. It is not inconceivable though that at least some part of the ECA's net negative balance went to fund activities connected with President Obasanjo's Third Term Agenda." Following the collapse of the agenda, President Obasanjo went after some of those he held responsible. One of these was Atiku Abubakar, his vice president, whom a panel he set up and the EFCC indicted of fiddling with funds at the Petroleum Technology Development Fund (PTDF). 2019 Presidential aspirant and former vice president, Abubakar Atiku. Mr Abubakar appeared before a 13-member Senate committee on 18 December 2006 to address the allegations raised by Mr Obasanjo and the EFCC report. "Atiku proceeded to share with the committee various transactions and approvals Obasanjo had been involved in specifically with the PTDF. For instance, six days before the Senate killed the third term project, President Obasanjo approved the immediate release of N10 billion out of the N20 billion requested by PTDF for undisclosed projects. 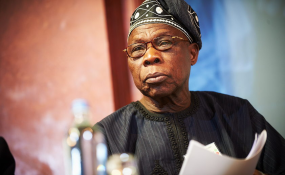 The unspoken suggestion was that Obasanjo had approved these funds to benefit his third term project," the book states. There were also other sources of funds outside federal coffers. "Sometime before the National Assembly debate on amendments to the Constitution began, Governor (Saminu) Turaki reportedly sent N17 billion and $20 million in cash to Abuja," the authors state. "In his defence against money laundering charges brought against him by the EFCC for siphoning N36 billion out of Jigawa State, he admitted that this formed part of his investment in the PDP's third term project. "Turaki was also among the governors who invested in a third term for Obasanjo because it meant a third term for those who were in their second term of office and extra terms for those in their first. Some of the governors who joined him in the support group of tenure elongation, whether out of self-interest or self-preservation included: Ahmed Makarfi (Kaduna), James Ibori (Delta), Bukola Saraki (Kwara), Umaru Yar'adua (Katsina), Bukar Abba (Yobe) and General Olagunsoye Oyinlola (Osun)." But it was not just a public sector affair, according to the book. "In the shadows were budding oligarchs and private sector operators who knew enough to be part of every government. They had morphed into a formidable clique during the Obasanjo administration as the main beneficiaries of a privatisation policy from which they profited tremendously. "While the majority were and have not been open about their involvement in or support for a third term, Festus Odimegwu, then Managing Director of Nigerian Breweries at the height of the advocacy for and aginst a third term, threw his hat firmly in the ring for tenure elongation and lost his job for it. "The cream of this businessmen and women became part of Transcorp, which was launched with much fanfare by Obasanjo at the Presidential Villa in Abuja in July 2005. Transcorp became the symbol, identity and totem of 32 of Nigeria's wealthiest people. In addition to billionaire financiers, Aliko Dangote and Femi Otedola; bankers Tony Elumelu and Jim Ovia, and Odimegwu, this group included former CEO of First Bank Plc, Bernard Longe, who was appointed the first CEO of Transcorp after Obasanjo summarily removed Fola Adeola, the pioneer Managing Director of Transcorp. "Apart from having a mind of his own, Adeola was said to have harboured ambitions to run for a seat in the Senate, in which Obasanjo's eldest child, Iyabo, a veterinary doctor, was also interested. After he made his anti-third term public, Obasanjo also had Adeola summarily removed from his position as Chairman of the Pension Commission. "Others included Jacobs Moyo Ajekigbe, MD/CEO of First Bank of Nigeria Plc. ; Otunba Funsho Lawal, CEO of Charterhouse Group; Tony Ezeanna, CEO of Orange Drugs and Adegboyega Olulade, an investment banker and stockbroker. "Also part of this group until his death was Waziri Mohammed. From the Nigerian Stock Exchange, Nicholas Okoye, who was designated as the head of derivatives trading, joined his boss and Director General, Ndi Okereke-Onyuike, in this select assembly of Obasanjo's favoured businessmen and women. "Transcorp raised N16 billion through private placement and had the good fortune to be the successful bidder for 71 percent of Nigeria's former telecommunications monopoly, NITEL. It was also proud owner of Nicon-Noga Hilton Hotel, which many considered a national heritage, a concession for a 400,000-barrel per-day refinery at the Lekki Free Trade Zone and independent power plants. "Other assets auctioned to the group were oil blocs to enable the new company operate in the upstream oil and gas industry. The controversy around Obasanjo's acquisition of 200 million shares of Transcorp gave no pause to his ardent supporters for whom he was the model of exemplary leadership. "A few months after the launch of Transcorp, the Manufacturers Association of Nigeria (MAN), made a case for a third term for Obasanjo. Charles Ugwu, the president of MAN, suggested that he spoke for the private sector in support of tenure elongation when he described Obasanjo as an example of rare, experienced and mature human resource. "Addressing the 34th annual general meeting of the MAN on 15 November, 2005, Ugwu asked rhetorically: '(S)hould we package him in a box and put on a shelf of retired leaders and seek out a neophyte with whom we would experiment?" The benefits of a close collaboration between the presidency and private sector were too glaring or resist,' he argued. According to the narrative by the authors, the seed for the Third Term Agenda was planted in the first term of President Obasanjo. "The seed germinated perhaps innocuously, from the idea that political stability and continuity of policy was vital to Nigeria's economic development. "As chairman of the G77 developing countries, Obasanjo was an active and vocal advocate for debt relief in the context of the Jubilee 2000 global campaigns calling for debt relief for Heavily Indebted Poor Countries (HIPC). "This required meeting conditions of the Bretton Woods institutions, some of which entailed economic reforms. With this realisation, the Obasanjo administration reportedly worked feverishly, first with his ALF (African Leadership Forum), and then with the New Partnership for Africa's Development (NEPAD), to create a blueprint for economic reforms. Their efforts came to be known as the National Economic Empowerment and Development Strategy (NEEDS). "During this exercise, the penny dropped. It dawned on Obasanjo that he would not be in office long enough to oversee his plans for Nigeria and towards the end of 2002, sources recalled, in a meeting about the reforms which would lead to debt relief, President Obasanjo confessed that he would not be able to execute his vision without first tackling the political problems, starting with his own party, the PDP." The campaign for debt relief for Nigeria eventually yielded results in 2005 when the Paris Club of creditors granted Nigeria debt forgiveness to the tune of $18 billion after an agreement that the country was owing US$30 billion and would immediately repay the US$12 billion balance. "Advocates of 'consolidation' sprouted, nourishing the roots of the idea that Obasanjo needed more than two terms in office. The Nigerian shorthand for this was tazarce, the noun for 'continuity' in Hausa, the major language in Northern Nigeria," the authors state. It started with the campaign for Mr Obasanjo to seek reelection, against the backdrop that he had in 1998 reportedly pledged to those who prodded him to power that he would serve only one term. One of the leading advocates, Tony Anenih, said about his support for a second term for Obasanjo that '... it would be unwise not to allow Chief Obasanjo have a second term. This second term would enable him consolidate and complete the transformation of the society'". Mr Anenih was at the time Minister of Works and Housing. After Mr Obasanjo's reelection, the book states, the plans for a third term began in earnest. "The people and stakeholders that worked together for a third term for Obasanjo were driven by different reasons and interests; for instance, self-interest was an underlying motive for many," states the authors. Aside cabinet members like Nasir El-Rufai, Ngozi Okonjo-Iweala and Frank Nweke, were others like Nuhu Ribadu who was chairman of the Economic and Financial Crimes Commission. "Many of the courtiers for Obasanjo's self-succession were repeat offenders from previous episodes with uniformed military rulers. The currency of such campaign, they knew, was cash - lots of it. "It was expensive to incentivise people, mobilise support across the country and hold conferences and rallies in support of any self-succession plan and best of all, most transactions were in cash and largely untraceable. "Legislators needed the money to buy their reelection or prepare for their retirement amidst the realization that they could become electoral liabilities, irrespective of how third term ended. Governors needed money to buy off legislators in or from their states and Obasanjo and his acolytes were in a similar predicament at the federal level. "The natural logic of Obasanjo's third term aspiration was predicated on him spreading money around. Corruption was a necessary and inherent element of the Third Term Agenda. "This gave birth to a cottage industry of third term investors and beneficiaries from the military god complex such as Femi Fani-Kayode and Andy Uba. Some did not fall neatly into any category but were driven by their closeness with Obasanjo to fall for the narrative that Obasanjo was Nigeria's best option for progress and development. "Finally, there were the legislators who formed a key part of operations to secure a third term for Obasanjo. In the Senate, Ibrahim Mantu, Ifeanyi Ararume and Jibril Aminu were some of the leading figures involved in the lobby to induce legislators to accept the constitutional amendments. "Within the House of Representatives, there were several caucuses across interests, geography and parties. For instance, there was the Unity Forum led by David Idoko. Under the guise of advocating for the unity of Nigeria, this group of legislators sought to drive support for the Third Term Agenda within the public and amongst legislators. In return, many of them were reportedly well rewarded. "These foot soldiers committed to the glory of a third term, an ode to Obasanjo's now personal god complex, worked towards their goal with the aid of various strategies guided by Obasanjo's mechanical engineering mind. What was needed? Who was needed? Who could be bullied or bought? "Some of the strategies were familiar and had been used by other self-succession artists. The key tool was incentives - the trade by barter that had worked so well in keeping elite support for military rule for over 29 years. "Positions were offered. Sitting governors, for example, would enjoy tenure elongation as well and several loyalists from the North had been promised that they would become Obasanjo's vice president during his third term. "Financial reward was also a huge inducement. The most credible figure for members of the National Assembly was N50 million for each member of the House and N75 million for each senator who would vote for the tenure extension amendment." Mr Obasanjo has repeatedly denied he ever planned to stay longer than the two terms the Nigerian Constitution allows a president and governors. But he has yet to speak on the claims in this new book.